If you’re reading this, I guess I know where you stand on the full chocolate protein pancakes issue. Some people may say pancakes shouldn’t be 100% chocolate, and those people can’t sit with us. Now that you’ve got your official chocolate pancakes membership card, I’ve got a treat for you. 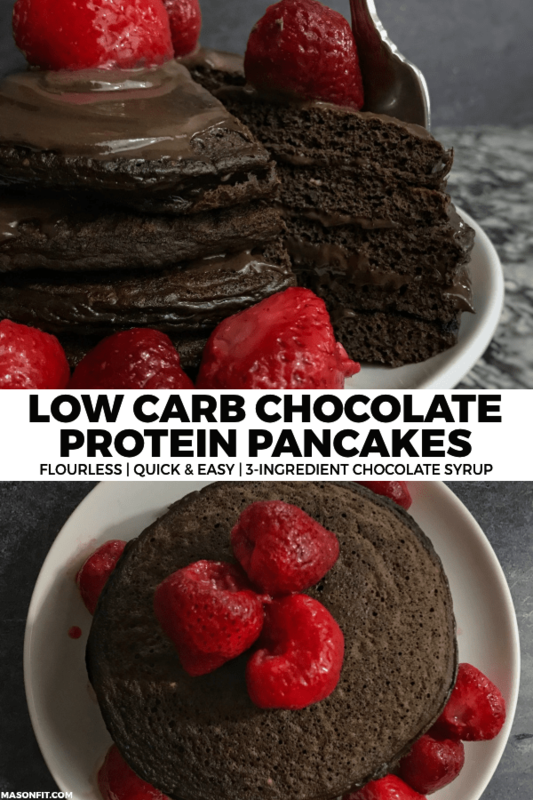 This easy protein pancakes recipe has ridiculously favorable macros with 230 calories and 31 grams of protein in the entire pancakes recipe. Include the chocolate syrup and you’re looking at 55 grams of protein and still only 390 calories. Cray cray, right? It’s really as simple as mixing a few things in a bowl and pouring batter into a pan. That’s part of the beauty of pancakes, in my opinion. They’re just easy to make. I’ll include a few ingredient notes and tips for making modifications below. You’ll obviously need protein powder but beyond that, ya got options. 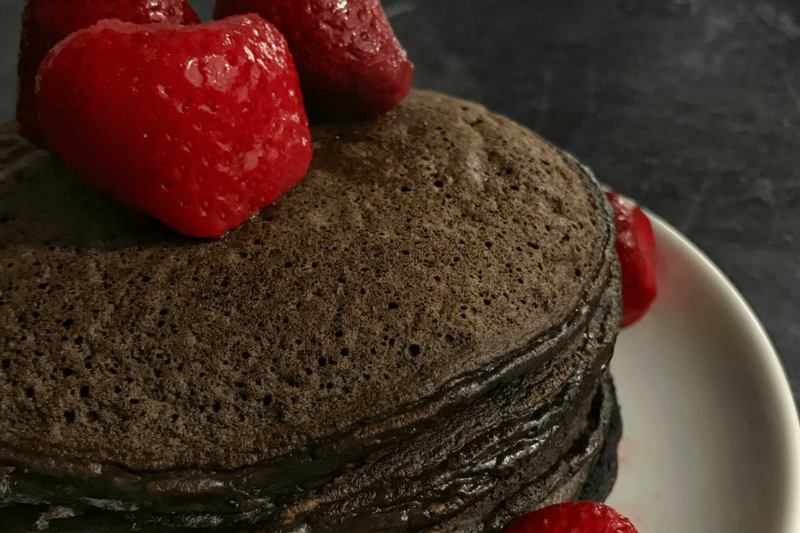 These chocolate protein pancakes use both pumpkin and unsweetened apple sauce as fat replacements. Both lend the creaminess that a fat source like butter or eggs provide with a fraction of the calories. Where one tablespoon of butter has 100 calories and one egg has 70 calories, the combined (almost) 1/2 cup of apple sauce and pumpkin in these protein pancakes contain just 45 calories. That’s a ton of volume added to the recipe without much cost to texture! In the past, I’ve used pumpkin exclusively in recipes like my pumpkin spice protein pancakes and original double chocolate protein pancakes. While pumpkin has a very mild flavor, most people can still tell it’s there. 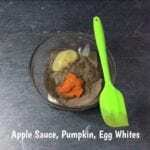 Apple sauce is similar, providing a hint of apple to even strong chocolate flavored recipes. But when you combine both in smaller amounts, I find their flavors all but drown each other out and allow the chocolate to really shine. If you’d like to use pumpkin only, swap gram for gram for the additional apple sauce (105g total pumpkin). And if you’d like to go apple sauce only, simply double the apple sauce (90g total). You can use any protein powder you’d like, though I recommend using a whey concentrate. 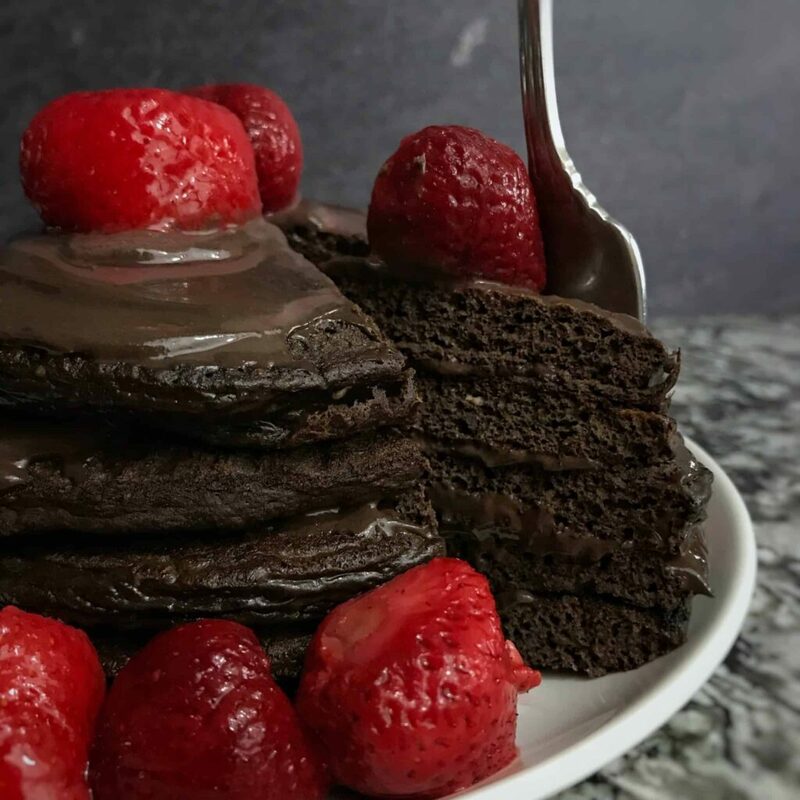 The macros for these chocolate protein pancakes are with one scoop of vanilla cupcake Dymatize 100% Whey, which has become my favorite protein to cook with. It tastes amazing but more importantly, it cooks really well. If you’re using a leaner protein like a whey isolate or a plant-based protein, you may have to modify ingredients like the apple sauce or pumpkin to account avoid dry or tough protein pancakes. Since I cook a lot with protein powder, I buy vanilla because it’s so flexible. 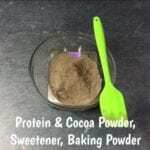 I can easily add cocoa powder or any other flavor profile to vanilla, but I can’t take chocolate protein powder in many other directions. The flavor of vanilla protein powder plus dark cocoa powder blows most chocolate protein powders out of the water. Seriously, try it. The chocolate syrup is admittedly more like a frosting. I kind of like that it stays in place, though, so I’m rolling with it. If you’d like a true syrup, simply add a bit of almond milk to hydrate things a bit further. 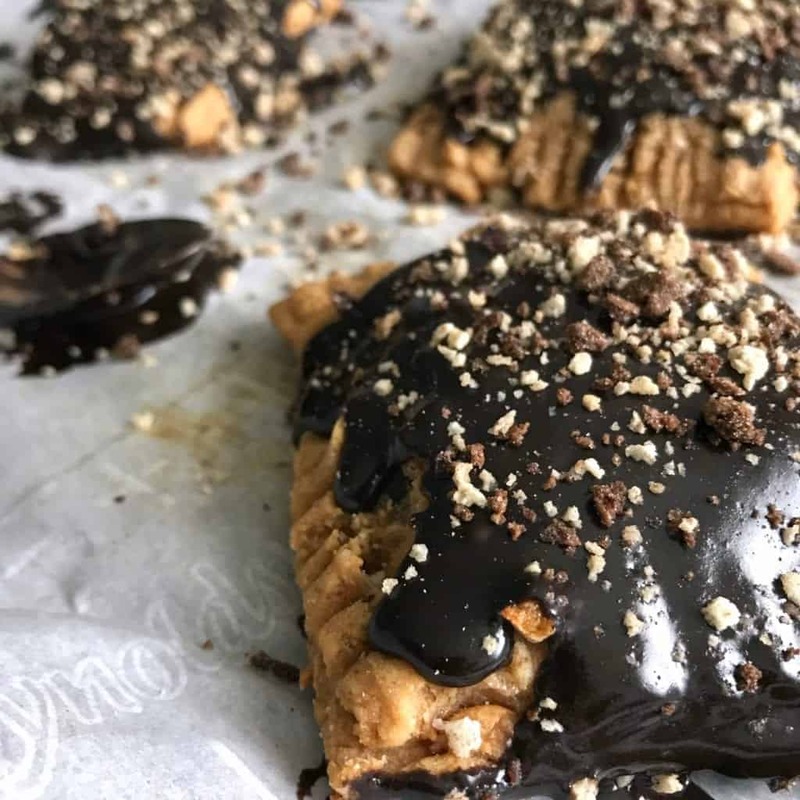 And if you’d like to go the other way with a legit chocolate icing, check out the filling from my chocolate peanut butter protein pop tarts. I bet that would be, as the kids would say, lit. All right, that’s all ya need to know in terms of ingredients or modifications. I hope you enjoy your chocolate protein pancakes! If you do, I’d love to see your re-creation. Snap a pic and tag me on Instagram. I’ll be sure to share it with the world. 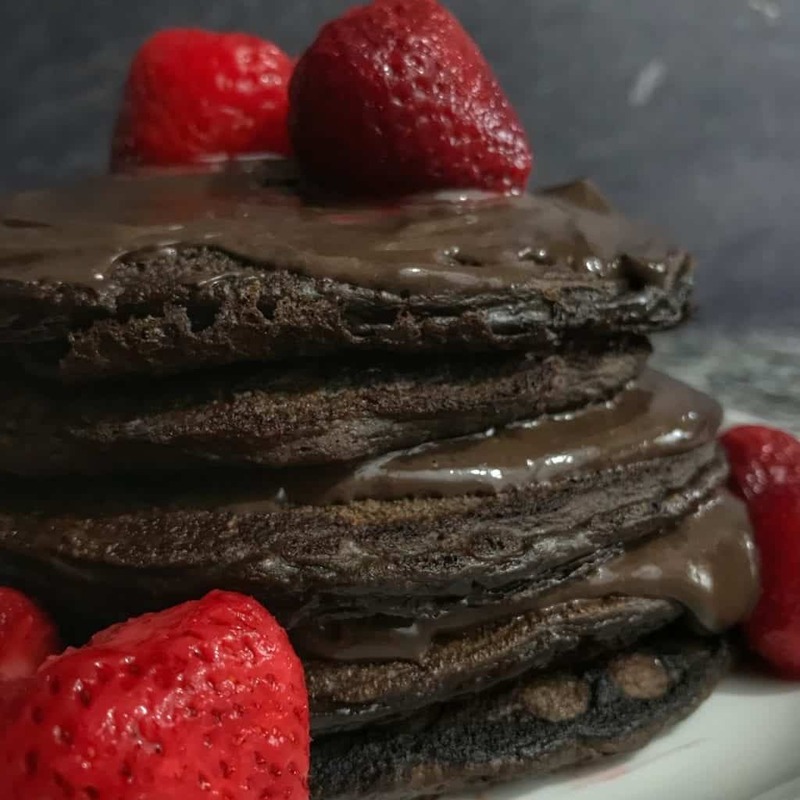 And speaking of Instagram, here’s a quick video walkthrough of these chocolate protein pancakes I posted on the ‘gram. 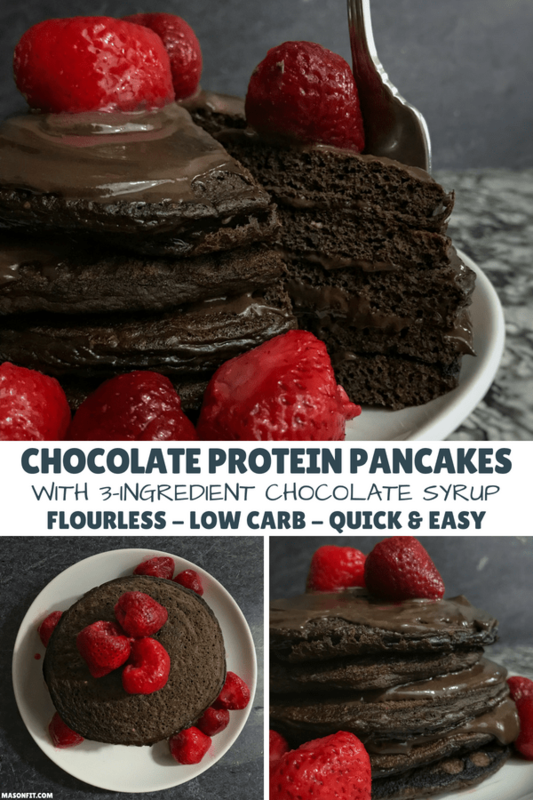 Flourless, low carb chocolate protein pancakes with a high protein chocolate syrup to drown them in. Mix the dry protein pancake ingredients together in a large bowl. Gradually stir in the pumpkin, apple sauce, and egg whites. Stir until smooth. 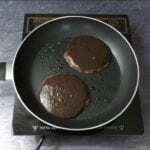 Heat a large skillet or griddle over medium-high heat with nonstick cooking spray. 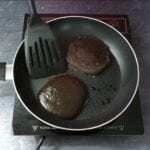 Cook for 2-3 minutes or until you start to see bubbles on the top side before flipping. Be careful not to burn the bottoms. Remove to cool while you mix the chocolate syrup ingredients together in a bowl. Top and serve. Enjoy! If you'd like to use pumpkin only, swap gram for gram for the additional apple sauce (105g total pumpkin). And if you'd like to go apple sauce only, simply double the apple sauce (90g total). You can use chocolate protein powder, but you may want to still add a bit of cocoa powder or extra protein for structure/flavor. Gram for gram should work fine. 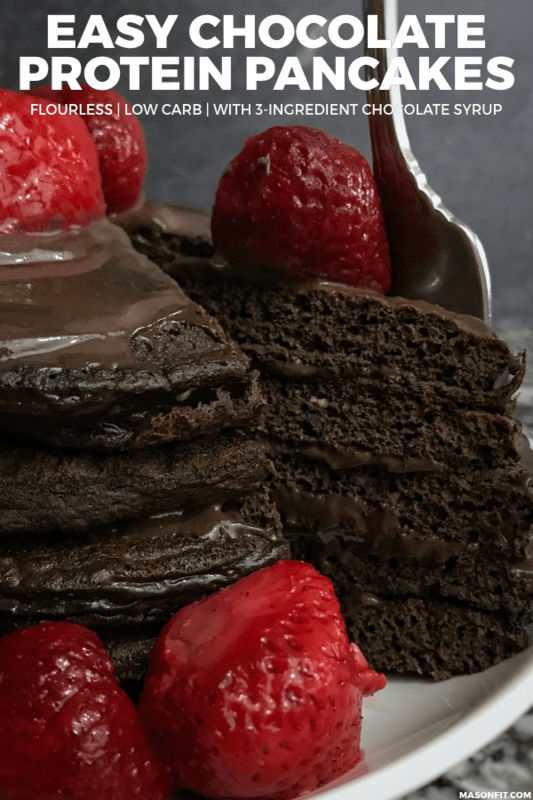 As a welcome present to the official chocolate pancakes family, I’d like to give you a free cookbook if you’re into that sort of thing. 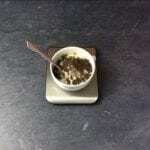 It has nearly 30 of my most popular high protein chocolate recipes. Simply enter your info below and I’ll send a copy straight to your inbox. How long do they stay in the fridge for? Did you prep a whole week? They should be good for at least 3-4 days. 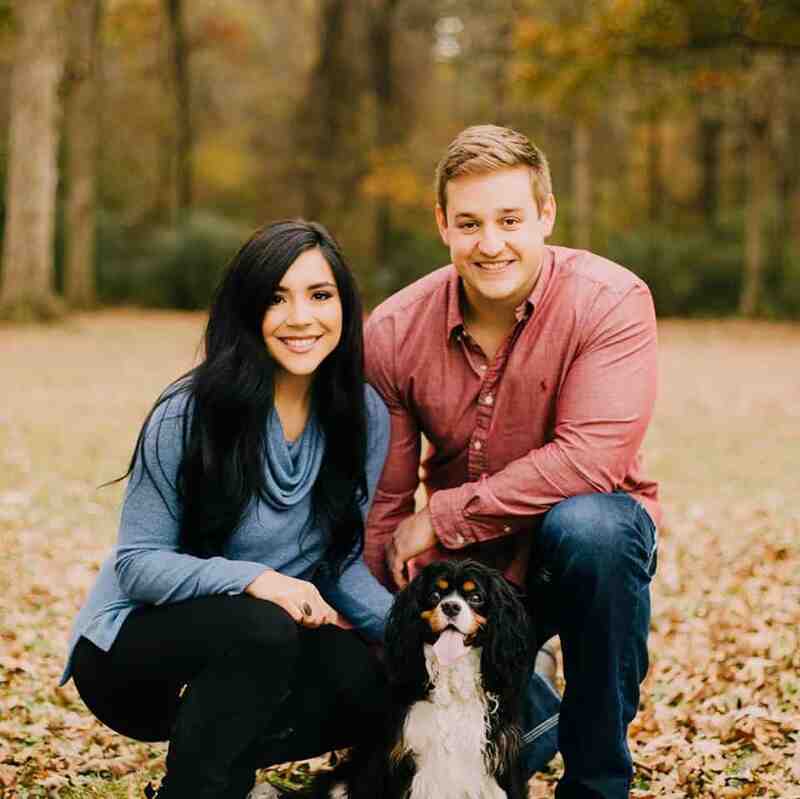 I’ve had several readers make things like protein pancakes in bulk and freeze. They should thaw overnight and be ready to go if you’re having them for breakfast. These pancakes are literally the best thing ever! Can’t thank you enough for creating this recipe. 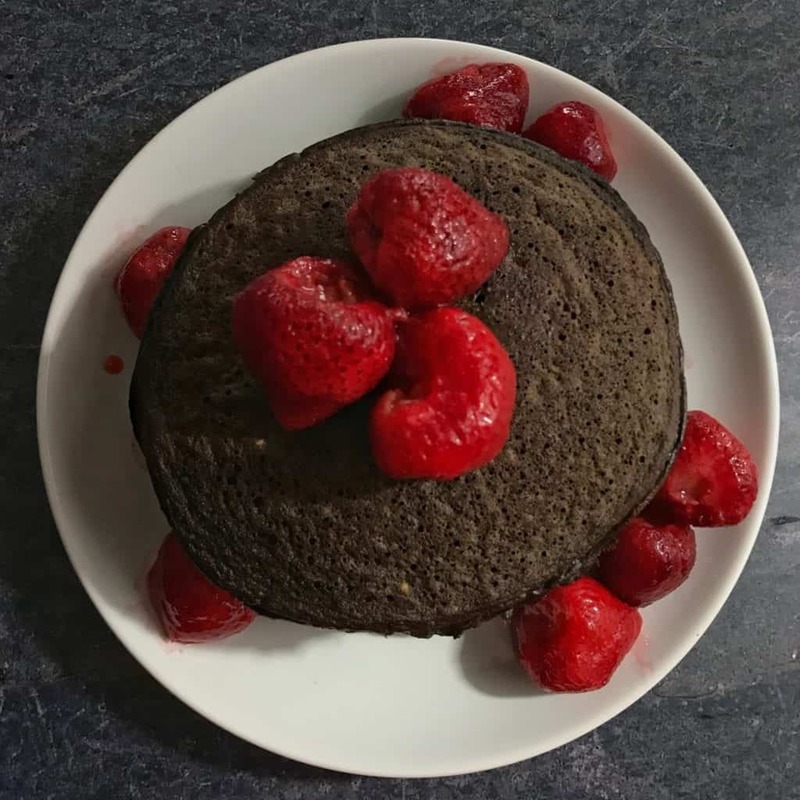 I have been looking for a recipe for chocolate protein pancakes and I never got around to finding a good one and when I tried this one it was great! The texture was perfect and it wasn’t overly sweet at all! Loved it so much! These are decadent and delicious. If you have a chocolate craving, make these. I even made them for dinner one night because they are so high in protein! Thank you for this recipe! I’ve been pretty bored with breakfast lately and wanted to kick it up a notch but not spoil my healthy eating. These pancakes were declicious! I’m so glad I had all the ingredients on hand this morning.